If you are in the market for a reliable and affordable or even just a basic coverstitch machine, this review will help you to make a choice. I’ll be starting with the most complex one first. This current model used to be the MF-7823 and has now been updated to the MF-7923. When I first look at this machine, I see a very complex looking industrial type cover stitch sewing machine. The MF-7923 comes with an assembled table which has a clutch motor to operate it. It seems that a common problem with cover stitch machines is the looper thread twining so two modifications have been done. The first one has to do with the installation of a metal cover for the looper thread to prevent it from wrapping around the looper cam shaft. The second modification has to with the installation of a thread cutter, which will cut the looper thread to prevent it from becoming wrapped around the metal cover. The manufacturers describe this machine as a basic model with a broad range of purposes. As such it is used to hem sleeves, covering knits and sportswear and also hemming the bottoms of T shirts. A Needle Bar Stroke Conversion Mechanism adjusts the force with which the needle penetrates heavier fabrics. This same mechanism also adjusts the thread tension to suit the fabric. The Micro Lifter Mechanism allows for the sewing of lighter fabrics and elastic fabric with the presser foot barely raised off the fabric. This reduces pressure on the fabric and prevents damage or warping. Another improvement to this model is the Stitch Type Change Over, which allows you to change the path of the thread for loose soft seams or tighter tense seams. While this machine has differential feed, it is different from the norm because of the micro adjustments which can be made. It allows for fine tuning based on the fabric and even if you change the stitch length the differential ratio remains constant. From the features you can see that this is a really high end machine and much that thought has gone into the design features. This machine looks more like what I am accustomed to seeing in a home setting. It is definitely not as heavy duty as the Juki but it is ideal for managing your home based project loads and then some! 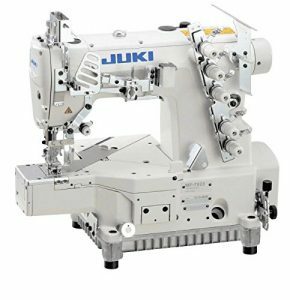 Its appearance is reminiscent of the Brother 1034D Overlock Machine because it uses the same colour coding for the various threads. The cover stitches it produces are 3mm and 6mm long, and can be formed from 2, 3 or 4 threads. The 2340CV is also capable of producing chain stitches and the differential feed produces even stitching. An additional stitch which this machine does is the flatlock for which there 1, 2 or needle options. Along with the standard presser foot you will find included a gathering foot and a blind stitch foot along with the other accessories and manual. Like many of its other Brother counterparts, the manufacturers do not recommend its use in countries which do not support 120 V AC. Even if you decide to use a voltage adapter with your machine, it is still not recommended. If you are looking for a cross between an industrial machine and a home use machine, this next model deserves your attention. This machine offers the best of both worlds from the industrial and the domestic side. 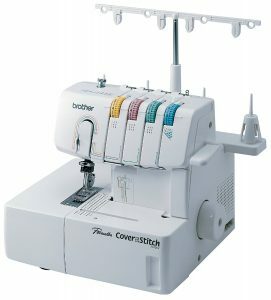 This fast, heavy duty cover stitch machine looks more like a regular sewing machine rather than a traditional cover stitch one. This is due to the fact that the sewing arm is longer than in other models. It also works just like a regular sewing machine. I think the appearance of it takes away a lot of the apprehension about using such a specialized machine. 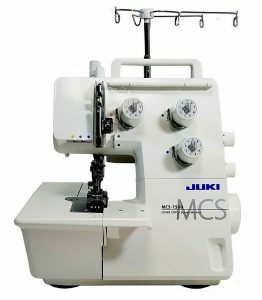 This machine is dedicated to cover stitching and allows you to create these stitches on the hem of the garment and anywhere else on the fabric for that matter. It does not cut fabric as it sews because it performs the sole function of making structural or decorative cover stitches. 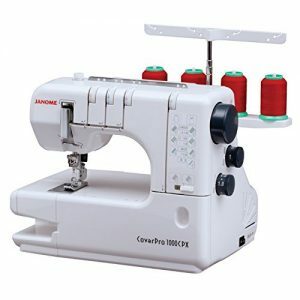 The 1000CPX also comes with the Janome Seam Tightening System for secure stitching. In the way of accessories you’ll find in the package 13 needles, a needle threader, a seam guide, 2 spool caps, a cleaning brush, 2 screwdrivers and an accessory box for storage. This compact finishing machine is perfect for sewing chain stitches and cover stitches. The cover stitch is perfect for use on necklines, cuffs and hems. The chain stitch feature allows you to stitch the side seams of pants, waistbands and do decorative stitches on the necklines of garments. Both stitches work beautifully on stretch fabrics since they are both stretch stitches. The tip of the presser foot slopes upward for easy fabric placement and the presser foot lifter raises it high enough to easily accommodate thicker fabrics or layers of fabric. Threading the looper is very easy because all you have to do is press a button to lower it. Its adjustable differential feed allows you to make adjustments according to the fabric type so you can get a neat and professional looking finish every time.